This session has been approved by the American Board of Preventive Medicine as a Patient Safety Activity required for diplomates certifying or re-certifying in Preventive Medicine. Describe the role that spontaneous adverse events from the VAERS program play in the Food and Drug's evaluation of vaccine safety. Discuss concepts to understand diagnostic errors and learn about potential solutions. Describe measurement of diagnostic errors in current electronic health record (EHR)-enabled healthcare settings. Describe joy in work; identify signals of burnout; and articulate the link between burnout and joy in work to patient outcomes. 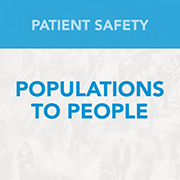 This session will explore patient safety from several different perspectives relevant to population health and preventive medicine: large scale (national) surveillance and response, the "sharp end" of ambulatory care, and the link between burnout and joy in work to patient safety outcomes. The Vaccine Adverse Event Reporting System (VAERS) will be discussed in detail, and it will be used as a model to show the current way that spontaneous adverse event reports are analyzed by FDA medical officers. New innovations being explored at FDA will also be discussed, such as machine learning and natural language processing of adverse event reports. In addition, this session will discuss contributing factors related to diagnostic error in outpatient settings and provide action-oriented recommendations to support improvements. Finally, this session will explore joy in work, signals of burnout, and actions that leaders can take to impact joy in work.